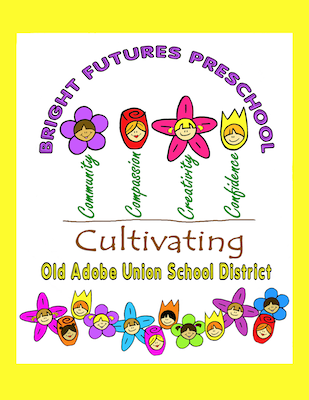 Welcome to Old Adobe Union School District! The Old Adobe Union School District is located in southern Sonoma County and serves the children, parents, and community on the east side of Petaluma, California. With “Excellence for Learning” as our mission, our vision is one of establishing high expectations in an environment of caring and nurturing where each child achieves his or her personal best. Staff members in this system are proactive, efficacious and resourceful about improving student learning and raising expectations; at the same time they are accountable to their students, parents, and principals. The District's dedicated faculty and staff provide an excellent learning environment for close to 1,900 transitional kindergarten through sixth grade students that attend its five elementary schools and up to 24 preschool students in our kindergarten readiness program. Additionally, the district provides a unique opportunity for intercultural learning through its Spanish/English Dual Immersion program, as well as fostering a passion for learning with its varied standards based programs that include arts infused teaching and a focus on critical and creative thinking. Dear Parent/Guardian California has launched a new website designed to help communities across the state access important information about K-12 districts and schools.